Well I can't believe it's been almost a week since I last posted, this week has just flown, I've been so busy catching up after my two weeks of Jury Service. But I'm back now and so happy to be creating again. As it's Saturday it's my turn to post on the Bubbly Scrumptious Blog. This week I've been playing with chipboard. All the details are HERE. I think this new shade of Seam Binding from The Ribbon Girl has got to be my favourite colour yet, it's called Wavecrest - love it! I bet you're pleased your Jury service is over Vicky. Since being back at work, the weeks really are flying by for me too. 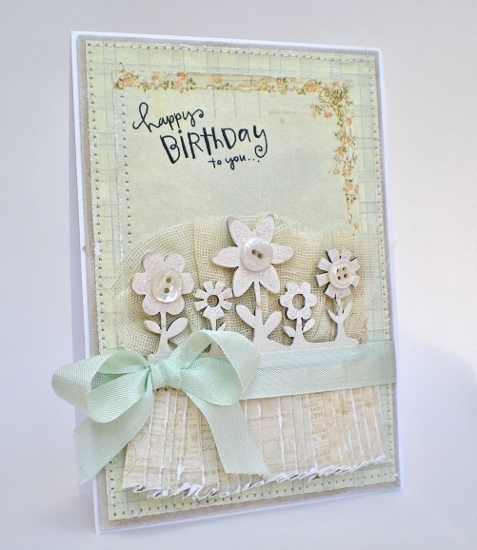 Love your card, the chipboard flowers look fab as does that gorgeous seam binding. Stunning and I love that colour of seam binding! Gorgeous work as always, Vicky! Hope everything is going ok and can't wait for our coffee date! !